"I can create stellar castles and recovery dreams." At first this seems to be a quote created from a thought. This quote speaks to the broadening of the imagination. More imagination is something we could use more in this world. As we move forward through time and space we discover that the sky is the limit. It takes a lot of imagination to believe that the options are endless like a sea of dreams. Creating a castle in the sand takes imagination. To build a creative society takes imagination. And yes, hearing voices takes being imaginative. You don't have to try hard to use your imagination. In the case of hearing voices, sometimes the voice can be created. Other times it comes about naturally like a natural phenomenon. Some people claim to hear good and bad voices. At one time, I heard voices that would command me to do things. They were scary and sometimes I thought they came from God or the Devil. If it was the Devil it was not a good voice. If it was God it was a kind voice. Is it possible to accept and surrender to the voices? Yes. This can help the individual to identify the good, unique voices and root out the bad, scary ones. Surrendering to a voice means letting it be and sometimes means letting go. 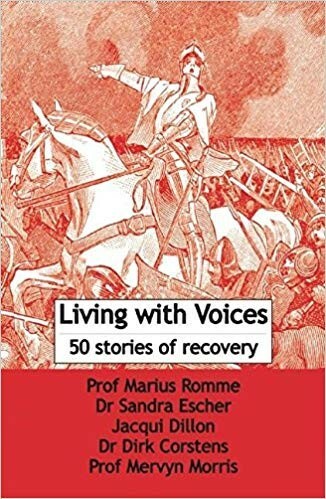 In the book Living With Voices: 50 stories of recovery (published in 2009 by Prof. Marius Romme and Dr. Sandra Escher) the primary focus is accepting the voices and eliminating the stigma about them. I find this to be a fascinating and revolutionary approach in all aspects of recovery. A recovery revolution of sorts. That is the opposite of the medical model. It is also the recognition the some voices are good and not immediately harmful. This helps us to not label the person a "schizophrenic" or a "psycho." It's a sensitive, kind and compassionate approach. The special mentor you are working with should be kind and connective when it comes to hearing voices. It's a long way away from the old "institutional", "traditional" views of psychotic disorders. When I would hear voices in the basement it's as if they were summoning me. I felt very alone and afraid. The voices would whisper to me. A book called Loving Kindness, written by Susan Strasberg, helped me to decrease the voices I was hearing. It talked about earth meta and centering one's self. As I would read each word I would feel soothed. It was a meditation. But I was a long way from kindness and being kind to myself. The gentle rubbing of the forehead and letting things go were not part of my coping skills toolbox. It wasn't until later in my life when I discovered I had meaning. A meaning for being on Earth. It was to help people. Just Be Nice For Once!